How do we prepare children for the rapidly changing society that we call the 21st century? And how do we ensure that our teachers have been fully exposed to the challenge before they commission the buildings in which that learning will happen? Leaping over jets of water in the playground, a group of 10-year-olds at Luckwell Primary, Brislington, Bristol, are clearly having a whale of time. They whoop with laughter as they splash one another and their head teacher Sue Roberts. 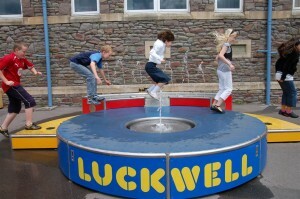 The children are playing on the Luckwell Fountain, an interactive water feature they have helped to create. But although it is a playground asset to make pupils across the country envious, the fountain at the Bedminster primary is not just for fun. Its development has been a learning process for children and staff and now it is about to have a revolutionary impact on the school’s curriculum. “It is all about taking learning beyond the classroom and allowing children to take the lead,” said Ms Roberts. The £100,000 Fountaineers project has involved the school’s 208 pupils and its staff working with the Bristol education innovator Futurelab and a community design agency called Stakeholder Design. It began two years ago after Sean McDougall, managing director of Stakeholder Design, came up with the idea of an “intelligent fountain” that would respond to people in various ways. Having worked with Luckwell Primary before, Futurelab approached the school again. They asked the children for their ideas on what the futuristic feature should look like. The youngsters soon worked out some of their suggestions, such as a chocolate fountain, or one containing goldfish, would not be practical. Eventually, a design was chosen – but then the pupils learned it would have to be altered, because of the cost. “There were frustrations along the way, but that enabled the children to learn about compromise and about practicalities,” said Ms Roberts. The final fountain, unveiled last month by Bristol City footballers including Louis Carey, has a range of sensors that can react to both behaviour and touch. For example, as a child runs past it at speed the water starts to gush, emulating the speed of the child. It responds to children pressing their hands and feet on the fountain and can be programmed to react to sound and to music. It has even been used to lift the school mood. “If you have had a bad morning in class, you go out and everyone is dancing by the fountain and having fun and it makes you feel really happy,” said Year 6 Beth. Classmate Aaron added: “If you are bored, it just makes you wake up.” Sue Roberts said: “Working as co-designers on Fountaineers has proved rewarding for both staff and pupils. “The teachers were surprised at the children’s level of engagement and their contribution to the project. “Without much guidance at all the children, working across age groups and classes, decided where we were headed with the design of the fountain and really led the project. “This collaborative approach to teaching and learning has been so successful that we want to tie it into the changes we are making to our curriculum as a whole. “We are gradually introducing a skills-based and learner-led curriculum with the fountain playing an integral part.” Sean McDougall said: “Fountaineers aimed to broaden the range of learning styles available to children, crucially making the link between school and the outside working world. “The intelligent fountain gives children as young as five the chance to learn and progress skills such as teamwork, problem solving, communication, persistence and inter-generational skills. The intelligent fountain is one of the most exciting and versatile outdoor learning resources available. Designed by 208 primary school children, it can see, hear and respond to what is going on around it. It’s one of many innovative learning resources developed by Stakeholder Design and it’s available now for schools everywhere. Click here for more info.